Award-winning promotion increases subscriber base by over 300%! The needs of the investment newsletter The Dines Letter and its writer/editor, James Dines, were two-fold: first, to introduce Dines to an audience not necessarily familiar with his “contrarian” point of view, and second, to sell his forecasting-success record to a skeptical readership. The vehicle chosen to introduce Mr Dines to the marketplace was a reader-friendly, reportalog-size publication. A 24-page format enabled CDMG to present a compelling story in support of Mr Dines’ expertise and past success. The mailing piece immediately grabbed attention with a dynamic headline quote, followed by a photograph of the newsletter writer speaking from a podium directly below it. The promotion went on to clearly define Mr Dines’ USP as a “contrarian” who disagreed with the “experts” and had years of success out-predicting these so-called experts. The story line highlighted the forecasting success record of Mr Dines, clearly showing how Mr Dines’ advocacy of gold investments had been highly profitable. Graphically, the piece relied on short, powerful subheads, well-placed and informative sidebars and graphs, and a clean, open design to make it effective and easy to read. To enhance visibility and appeal, CDMG packaged the offer as a “Wealth-Building Starter Kit” with special free premiums, plus a bonus booklet offer designed to encourage quick response. Far exceeding expectations and objectives, the subscriber base more than tripled—generating more subscribers than at any other time in the newsletter’s history. The results have generated over $3.82 for every dollar spent, surpassing results of competitive newsletters. 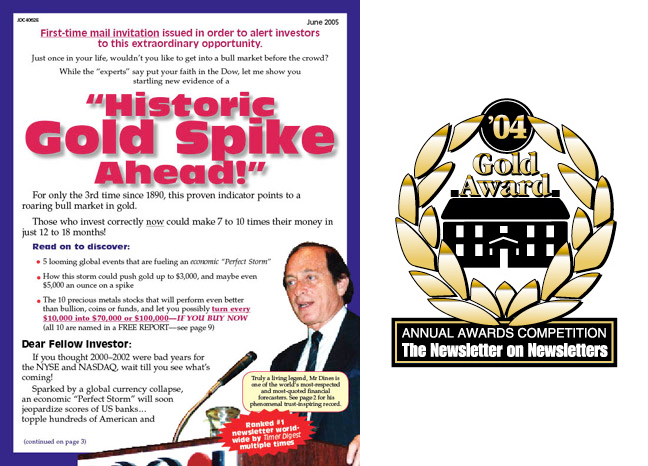 Because of the outstanding success of this strategic and creative direct mail package, CDMG won the Gold Award for best newsletter promotion from The Newsletter on Newsletters’ 2003­–2004 Awards Competition.